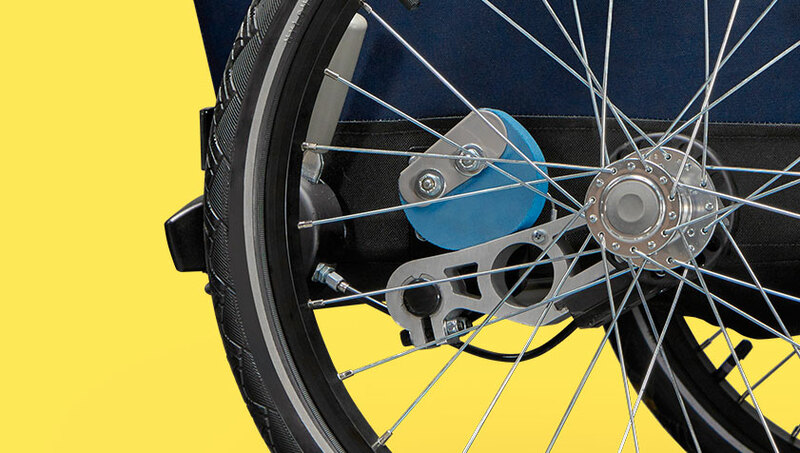 No adjustment required: the Croozer AirPad® is the only suspension system that adjusts itself automatically to the load. Regardless of how bumpy the road is and whether you’re carrying one infant or two older toddlers with a fully loaded rear cargo compartment: in the Croozer Kid Plus for 1 and Croozer Kid Plus for 2, your children will always enjoy a smooth and pleasant ride. Your bicycle trailer with its AirPad system glides effortlessly and reliably behind your bicycle with exceptional road-holding. 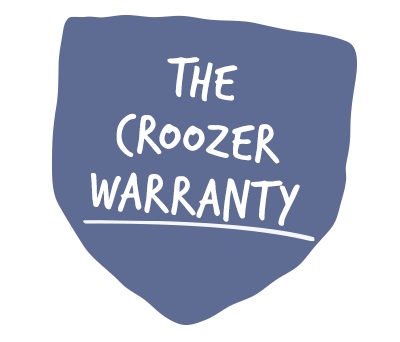 It keeps your Croozer Kid Plus from rocking or bouncing and ensures outstanding stability, even at higher speeds. For more info about the Croozer Kid Plus suspension system, check out our video below. And for all you techies out there: an in-depth description of the design can be found further down on this page! Simply on the move – simply comfortable! For the technical minded: this section is packed with detailed information on the design and construction of our unique suspension system. The eccentric compression progressively increases the volume of the suspension element (1). The result is a progressive spring characteristic curve. The large leverage ratio (5:2) with which the force is transferred from the wheel axle (2) over the pivot point (3) to the point of compression (4) ensures a highly responsive suspension performance. Sylomer® is the brand name for a polyurethane foam with a patented mixed-cell pore structure. The material is available in a range of densities for various static loads and is used for the dampening of vibration and noise, particularly in building and rail construction projects. Sylomer® features long-term dimensional stability and is resistant to short-term – and even extreme – overloading. It is weatherproof, does not wear and contains no hazardous substances. No care or maintenance is required. One unique quality of the Sylomer® material is its high suspension and damping effect, whereby the spring rate rises progressively with increasing compression. Sylomer® polyurethane foam plates are sold in various densities, which offer different mechanical properties. We chose a higher-density Sylomer® for the Croozer AirPad® suspension-damping element. The density defines the spring characteristics. The spring characteristics are further modulated with the design of the suspension-damping element as a partially circular disc. Thanks to this special shape, the volume of the vibration-isolating body is reduced under lighter loads. Likewise, the contact surface – and thereby the volume of the vibration-isolating body – gets larger as the compression increases. As the volume of the vibration-isolating body increases, the spring rate rises progressively over and above the inherent spring characteristics of the material. This ensures an exceptional suspension-damping behaviour over a wide range of wheel loads (approx. 5 to 60 kg). The passengers experience increased riding comfort, and the safety is significantly improved. The vehicle maintains contact with the ground at all times and cannot rock or bounce. In terms of the health effects of vibrations, stochastic impulses in the frequency band between 10 and 20 Hz with relatively high acceleration values – such as those experienced when riding over cobblestones – are considered to be particularly harmful. These frequencies are almost completely neutralised by the exceptionally high damping efficiency of the material. The responsiveness is determined by the positioning of the suspension-damping element on the deflecting spring arms and the resulting leverage applied to the suspension-damping element. We decided on a leverage ratio of approximately 5:2, which ensures a particularly responsive suspension under lighter loads and at vibrations in the frequency range of 10 to 20 Hz.